Refugees and their supporters took to the streets of Hamburg ahead of the G20 summit. We are resolved to tackle common challenges to the global community, including terrorism, displacement, poverty, hunger and health threats, job creation, climate change, energy security, and inequality including gender inequality, as a basis for sustainable development and stability. We will continue to work together with others, including developing countries, to address these challenges, building on the rules based international order. Digital transformation is a driving force of global, innovative, inclusive and sustainable growth and can contribute to reducing inequality and achieving the goals of the 2030 Agenda for Sustainable Development. To this end, we need to bridge digital divides along multiple dimensions, including income, age, geography and gender. We will strive to ensure that all our citizens are digitally connected by 2025 and especially welcome infrastructure development in low-income countries in that regard. We will continue our work for a globally fair and modern international tax system and welcome international cooperation on pro-growth tax policies... We commend the recent progress made by jurisdictions to meet a satisfactory level of implementation of the agreed international standards on tax transparency and look forward to an updated list by the OECD by our next Summit reflecting further progress made towards implementation. Defensive measures will be considered against listed jurisdictions. We continue to support assistance to developing countries in building their tax capacity. We are also working on enhancing tax certainty and with the OECD on the tax challenges raised by digitalisation of the economy. As an important tool in our fight against corruption, tax evasion, terrorist financing and money laundering, we will advance the effective implementation of the international standards on transparency and beneficial ownership of legal persons and legal arrangements, including the availability of information in the domestic and cross border context. The G20 has a crucial role in advancing preparedness and responsiveness against global health challenges. With reference to the results of the G20 health emergency simulation exercise, we emphasise the value of our ongoing, trust-building, cross-sectoral cooperation. We recall universal health coverage is a goal adopted in the 2030 Agenda and recognise that strong health systems are important to effectively address health crises. We call on the UN to keep global health high on the political agenda and we strive for cooperative action to strengthen health systems worldwide, including through developing the health workforce. We recognise that implementation of and compliance with the International Health Regulations (IHR 2005) is critical for efficient prevention, preparedness and response efforts. We strive to fully eradicate polio. We also acknowledge that mass movement of people can pose significant health challenges and encourage countries and International Organisations to strengthen cooperation on the topic. The adoption of the 2030 Agenda represented a milestone towards global sustainable development. We call on countries to work with stakeholders to strive towards its ambitious and integrated implementation and timely realisation in accordance with national circumstances. We commit to further align our actions with the 2030 Agenda for Sustainable Development and its integral part, the Addis Ababa Action Agenda on Financing for Development, domestically and internationally, including in support of developing countries and the provision of public goods. Enhanced equal access to the labour market, property, quality employment and financial services for women and men are fundamental for achieving gender equality and full realisation of their rights as well as a prerequisite for sustainable and inclusive growth. We are making progress in achieving our 2014 Brisbane commitment to reduce the gender gap in labour force participation by 25 percent by 2025 but agree that more needs to be done. We also commit to take further action to improve the quality of female employment and eliminate employment discrimination, and reduce gender compensation gaps and provide women with protection from all forms of violence. We will improve women´s access to labour markets through provision of quality education and training, supporting infrastructure, public services and social protection policies and legal reforms, where appropriate. Water is an essential and precious resource. In order to achieve food security, we are committed to increase agricultural productivity and resilience in a sustainable manner, while aiming to protect, manage and use efficiently water and water-related ecosystems. In order to harness the potential of ICT, we stress the need for strengthened cooperation on ICT in agriculture and underline the importance of access to high-speed digital services for farmers and of adequately serving rural areas. To enhance transparency in global food markets, we call for a strengthening of the Agricultural Market Information System (AMIS) and an active engagement of its entire membership. We underline that making markets function better can contribute to reducing food price volatility and enhance food security. It is vital for farmers to be profitable and, along with consumers, have access to national, regional and internation al markets. We launch the G20 Initiative for Rural Youth Employment in developing countries with a focus on Africa. This Initiative will, in alignment with developing countries’ strategies, contribute to creating 1.1 million new jobs by 2022vand to providing innovative skills development programmes for at least 5 million young people over the next five years. Recognising the famine in some areas of South Sudan and risk of famine in Somalia, Yemen and North-Eastern Nigeria, we are more than ever committed to act with the required urgency, supporting UN agencies and other humanitarian and development organisations in a coordinated and comprehensive response to save lives and support conditions for sustainable development. We welcome the outcomes of the G20 Africa Partnership Conference in Berlin, which highlighted the need for joint measures to enhance sustainable infrastructure, improve investment frameworks as well as support education and capacity building. Individual priorities for “Investment Compacts” were put forward by Côte d'Ivoire, Ethiopia, Ghana, Morocco, Rwanda, Senegal and Tunisia. Led by the respective African countries, the African Development Bank, IMF and WBG as well as the G20 and other partners, these Compacts aim to mobilise private investment as well as promote efficient use of public funding. Based on equal partnership, we strongly welcome African ownership and commit to align our joint measures with regional strategies and priorities, in particular the African Union’s Agenda 2063 and it’s Programme for Infrastructure Development in Africa (PIDA). The African Union and its specialised agency, the New Partnership for Africa’s Development (NEPAD), are important partners in its implementation and monitoring. The world is experiencing historic levels of migration and forced displacement. While migration is influenced by many political, social and economic developments, the main drivers of forced displacement include conflicts, natural disasters as well as human rights violations and abuses. Migration and forced displacement trends are of major relevance for countries of origin, transit and destination. The social and economic benefits and opportunities of safe, orderly and regular migration can be substantial. Forced displacement and irregular migration in large movements, on the other hand, often present complex challenges. 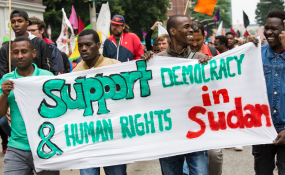 We support those countries that choose to develop pathways for migration, underline the importance of nationally determined integration and endorse the G20 Policy Practices for the Fair and Effective Labour Market Integration of Regular Migrants and Recognised Refugees. We emphasise the sovereign right of states to manage and control their borders and in this regard to establish policies in their own national interests and national security, as well as the importance that repatriation and reintegration of migrants who are not eligible to remain be safe and humane. We commit to countering migrant smuggling and trafficking in human beings and we are determined to take action against people smugglers and traffickers. We remain committed to fighting corruption, including through practical international cooperation and technical assistance, and will continue to fully implement the G20 Anti-Corruption Action Plan 2017-18. We endorse four sets of High Level Principles aimed at fostering integrity in the public and private sector. By endorsing the High Level Principles on the Liability of Legal Persons, we commit to ensuring that not only individual perpetrators but also companies benefitting from corruption can be held liable. We commit to organising our public administrations to be more resilient against corruption. We will intensify our fight against corruption related to illegal trade in wildlife and wildlife products. Wildlife trafficking is a threat to the planet’s biodiversity, economic development, and, among others, health and security, and is facilitated by high levels of corruption, which the G20 cannot tolerate. We also endorse the High Level Principles on Countering Corruption in Customs and publish a guide on requesting international cooperation in civil and administrative proceedings. We will continue our work to address integrity in sports and urge international sports organisations to intensify their fight against corruption by achieving the highest global integrity and anti-corruption standards. In this respect, we strive for a common understanding regarding corruption risks in bids to host major sport events. We are also committed to fighting corruption in contracts, including in the natural resources sector. We call for ratification and implementation by all G20 members of the UN Convention against Corruption and for a strong involvement in its review process.